High Shear Homogenizing Mixer (Reversible Homogenizers) | ARDE Barinco Inc.
High shear dispersion and emulsification plus - wet out powders and resuspend settled solids. High shear dispersion of solids and emulsification of immiscible liquids at extrememly high shear rates to produce the finest particle size distributions in the shortest amount of time. For more than 40 years, process engineers in the chemical, food, cosmetic, pharmaceutical, textile and coatings industries have relied on the Reversible Homogenizer from ARDE Barinco. Its highly effective dual mode mixing process disperses, emulsifies, and "wets out" powders and re-suspends settled solids. And it works in a fraction of the time it takes ordinary mixers. Now, we've made available a proprietary new feature that lets you control the shear rate by adjusting the gap between rotor and stator. 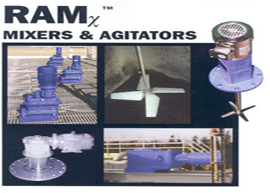 The unique axial flow impeller and rotor housing are optimized to produce the highest actual measured flow rates of any high shear rotor stator mixer available worldwide." Water pumping flow rates in the chart below reflect actual Doppler flow meter measured recirculation flow rates through the high shear zone. 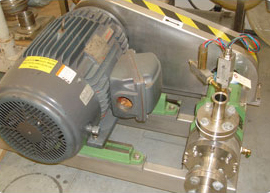 Other mixers may claim to be reversible, but their radial impellers simply push the mixture sideways, regardless of which direction they turn. The Reversible Homogenizer offers true reversibility. 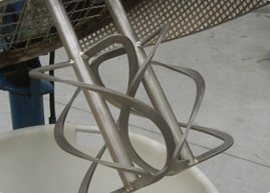 Its efficient, axial flow impeller creates two distinct mixing actions, depending on direction. 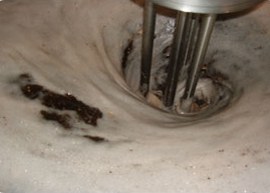 Downward vortex flow pulls in solids that tend to float on top and pushes off solids that settle on the bottom. The upward flow umbrella mode ensures thorough control of the mixing at the highest shearing and recirculation rates without splashing or incorporating air. The Reversible Homogenizer's incredible efficiency comes from a hydrodynamically optimized pumping design that provides higher recirculating rates through a far wider range of viscosity profiles. In addition, every model utilizes close-clearance zones to provide a combination of intense mechanical and hydraulic shear forces. Because the Reversible Homogenizer works faster than conventional mixers, you increase throughput without increasing operating costs. Why run two standard mixers when one Reversible Homogenizer can do the job? There's a wide range of Reversible Homogenizers available, from the lab size CJ-4E to the high-volume C-5-3. 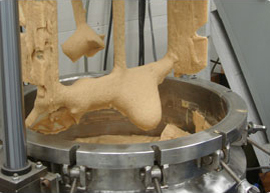 Each mixes materials in a wide ranges of viscosities, and each outperforms competitive mixers - even those with higher power requirements. 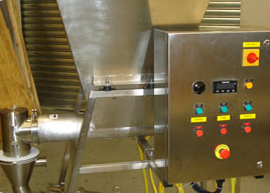 If you require mixing in sealed tanks, vacuum vessels or pressurized reactors, ARDE Barinco can build a Reversible Homogenizer for you using your specific processing parameters, we'll design and manufacture a sealed, top-entry or bottom-entry unit that uses the exact same high-shear mixing head as those used in open vessels. As with all our products, ARDE Barinco will let you find out if the Reversible Homogenizer is right for you by putting it through its paces at our fully equipped testing facility. You're under no obligation to buy; just give us your production requirements and we'll be happy to run capabilities tests. If you do decide to buy an ARDE Barinco product, you'll get free technical support for the life of the machine - fast, friendly service drawing on more than four decades of mixing experience. With a simple adjustment, you set the gap between the Reversible Homogenizer's rotor and stator. 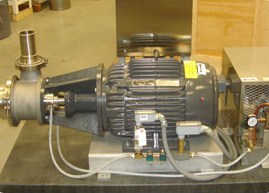 The mixer rotor/stator components do not have to be disassembled to complete this adjustment. Set the gap as tight as 125 microns for maximum shear. Back it off to 1/16" for easier applications. Or set it anywhere in between for the perfect balance.